From five-star restaurants to Grandma’s homemade cookies, cooking is an art that has transformed the way we taste food. But haven’t you ever wondered how cooking works? How in the world did people discover how to make Dipping Dots or Jell-O? 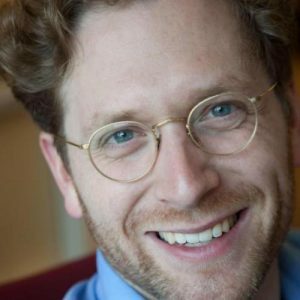 Patrick Charbonneau is an Associate Professor of Chemistry here at Duke and last Friday he gave a delicious talk about the science of cooking (with samples!). Around 10,000 years ago humans discovered that by fermenting milk you could turn it into yogurt, something that is more transportable, lasts longer, and digests easier. 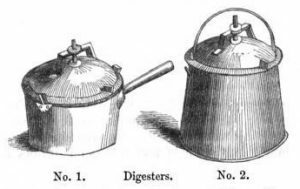 In the 1600s a new cooking apparatus called the “bone digester” (pressure cooker) allowed you to cook things faster while enhancing the flavor. When the 1800s came around, a scientist named Eben Horsford discovered that adding an acid with sodium bicarbonate creates baking powder. Soon enough scientific and kitchen minds started to collaborate, and new creations were made in the culinary world. As you can see, a lot of fundamental cooking techniques and ingredients we use today are a product of scientific discoveries. Old-school pressure cookers. Forerunners of the Instant Pot. A huge part of cooking is controlling the transformation of matter, or “a change in phase.” Professor Charbonneau presented a very cool example demonstrating how controlling this phase shift can affect your experience eating something. He made the same toffee recipe twice, but he changed it slightly as the melted toffee mixture was cooling. One version you stick straight in the freezer; the other you whisk as it cools. 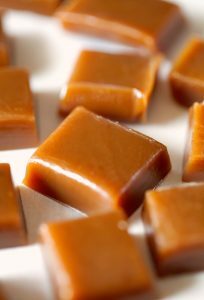 The whisked version turns out crumbly and sweeter; the other one turns into a chewy, shiny caramel. The audience got samples, and I could easily tell how different each version looked and tasted. 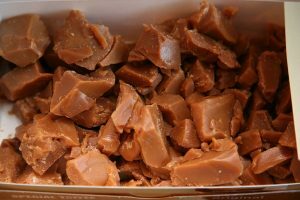 Charbonneau explained that while both toffees have the same ingredients, most people prefer the crumbly one because it seems sweeter (I agreed). This is because the chewier one takes longer to dissolve onto your taste buds, so your brain registers it as less sweet. I was fascinated to learn that a lot of food is mostly just water. It’s weird to think a solid thing could be made of water, yet some foods are up to 99% water and still elastic! We have polymers — long repeating patterns of atoms in a chain — to thank for that. 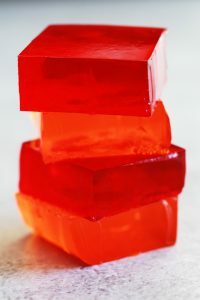 In fact, you can turn almost any liquid into a gel. Polymers take up little space but play a vital role in not only foods but other everyday objects, like contact lenses. Charbonneau also showed us a seemingly magical way to make cake. He took about half a Dixie cup of cake batter, stuck a whipping siphon charged with nitrous oxide inside it for a second, then threw it in the microwave for thirty seconds. Boom, easy as cake. Out came a cup full of some pretty darn good fluffy chocolate cake. The gas bubbles in the butter and egg batter expand when they are heated up, causing the batter to gel and form a solid network. Professor Charbonneau is doing stuff like this in his class here at Duke, “The Chemistry and Physics of Cooking,” all the time. In the past ten years a surge in science-cooking related classes has emerged. The experiments you could do in a kitchen-lab are so cool and can make science appealing to those who might normally shy away from it. Another cool thing I learned at the stations outside of Charbonneau’s talk was that Dipping Dots are made by dripping melted ice cream into a bowl of liquid nitrogen. The nitrogen is so cold that it flash-freezes the ice cream droplet into a ball-like shape!